Thanks to the Viola da Gamba Society of America (VdGSA)’s Consort Loan Program, Phillip Serna is partnering with Naperville North High School orchestra director Dana Green to start a viol consort program in Chicago’s western suburbs. However, we need YOUR help! 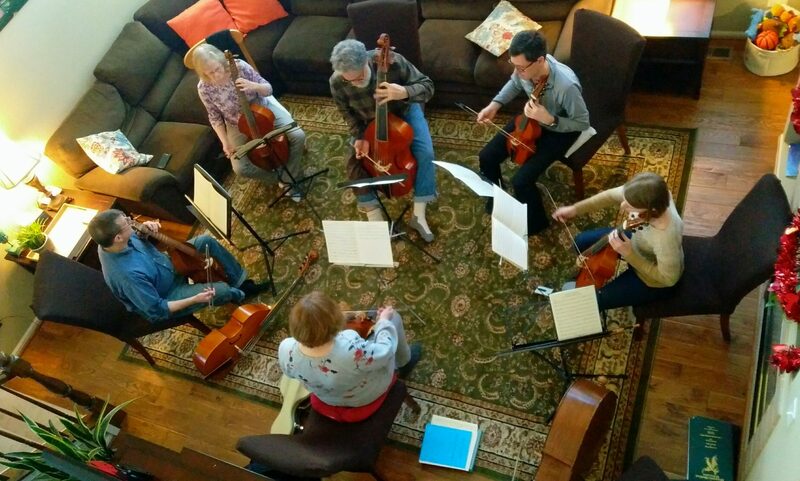 In an effort to engage the community, raise awareness about our work, we are holding a benefit concert to raise money to purchase viols once the loan period is exhausted. The Viola da Gamba Society 3rd Coast (VdGS Third Coast), New Comma Baroque’s Phillip Serna, the Naperville North High School Department of Music, and Grounds for Hope Cafe at Trinity Lutheran Church will present a showcase attracting top viol players from across the Midwest – and indeed the country – to marathon Schenck’s complete Nymphs of the Rhine. Please help us build a presence for Early Music in the western suburbs and consider giving! For more information on viola da gamba activities in greater Chicago-land, please visit the Viola da Gamba Society 3rd Coast at http://vdgs3rdcoast.org/3rdcoastconcerts/. For more information on the Grounds for Hope Café at Trinity Lutheran Church, visit http://www.groundsforhopecafe.org/. Mary Anne Ballard is currently a member of Baltimore Consort, Galileo’s Daughters, Fleur de Lys (U of Notre Dame), The Cat’s Paw (early viol consorts). Music Director, Play of Daniel (The Cloisters and Trinity Wall Street Church, NYC). Recent guest, Cardinal Consort of Viols, Toronto; Pomerium (NYC). Teaching: Current–Viola da Gamba at Oberlin Baroque Performance Institute, and U. of Notre Dame. Former–University of Pennsylvania Collegium (founder/director), Princeton University (Director, Musica Alta and viol instructor), Peabody Conservatory (teacher of viols and baroque ensemble). Degrees–BA Music, Wellesley College, MA Musicology–University of Pennsylvania. Private studies–August Wenzinger. Recordings on Dorian, Classic Masters, Gasparo, Smithsonian. James Lambert enjoys a varied career playing both double bass and viola da gamba. He joined the Cincinnati Symphony Orchestra in 1987 as Associate Principal Double Bass, and has soloed with the Orchestra and performed frequently for their chamber music series on double bass and gamba. The Orchestra’s tours have taken him all over the USA, Europe, and the Far East. He has been a faculty member at the University of Cincinnati’s College-Conservatory of Music, teaching the viol ensembles in the Early Music Lab, and at East Carolina University and the Eastern Music Festival. He has been a guest musician with the Catacoustic Consort (Cincinnati), Bourbon Baroque, Ars Femina (Louisville), and was a founder member of the baroque ensemble Apollo’s Cabinet. Regardless of what instrument he is playing, his favorite musical activity is accompanying singers. Eric Miller plays viola da gamba and baroque cello with the Wisconsin Baroque Ensemble and Eliza’s Toyes, and has appeared with the Madison Bach Musicians, and Ensemble Musical Offering. During the 2010 and 2011 seasons, Eric performed on cello with American Players Theater in the production of The Gift of the Magi. Also an accomplished trumpeter and able improvisor, Eric collaborates with musicians from all walks of life in numerous musical settings. With degrees from Northern Illinois University and the University of Wisconsin-Madison, his primary cello studies have been with Marc Johnson of the Vermeer Quartet and Parry Karp of the Pro Arte Quartet. A passionate educator trained in the Suzuki approach, Eric maintains a large cello and trumpet studio in central Madison alongside his wife, Sue Ellen Dubbert, a dedicated piano teacher. Eric has also served as an orchestra teacher for the Madison Metropolitan School District since 2009. Gail Ann Schroeder, viola da gamba, graduated from the University of Michigan with a Bachelor of Music degree in Music History. She furthered her performance studies on the viola da gamba at the Royal Music Conservatory of Brussels, Belgium, with Wieland Kuijken, where she obtained the First Prize and the Higher Diploma, with distinction. She has performed extensively as soloist and with numerous ensembles including the Huelgas Ensemble, Catacoustic Consort, Capilla Flamenca, Combattimento Consort Amsterdam and the Alabama Symphony. She has participated in numerous radio and television productions, and on CD recordings for such labels as DHM, Sony Classical, Ricercar and Erato. From 1988-2002 she was an assistant professor at the Royal Conservatory of Brussels where she taught viola da gamba, didactics of viola da gamba and was director of the viol consort. Since returning to the USA in 2006, Ms. Schroeder has been teaching at numerous workshops for the Viola da Gamba Society of America, the Amherst Early Music Festival, Mountain Collegium and participated in the endowed chair French Baroque Project at the University of Alabama. Currently living in North Carolina, she teaches privately and free-lances on viola da gamba. Since 2012 Ms. Schroeder is also an ATI certified teacher of the Alexander Technique.